← Home Tour: Palm Beach Mediterranean Mansion Shines for 2015! Celebrity Sneak Peak: 7 Stunning Living Rooms Owned by the Stars! Ever wanted to take a sneak peak into a celebrity home? Today we are giving you 7 gorgeous living rooms that are owned by the stars! Let’s see how their decorating skills add up! Donatella is the ultimate queen of both fashion and high-class design, so there is no wonder her home is jaw-dropping! I’ve placed my favorite room first since I couldn’t wait to share with you. I’ve actually blogged about her entire home tour right here in this post. The Kardashians are famous for having extravagant homes, weddings, and style. This newly decorated pad designed by Jeff Andrews exclusively for Kourtney was made over in a black and white color scheme. The striped walls make the room appear larger and the multi-level ceiling pendants give the room height. My favorite part of the room? Kourtney’s vintage coffee table find! This model turned philanthropist sure knows how to decorate a space! Karlie wanted a refreshing room where she can relax and enjoy her downtime when not walking the runway or helping out with charitable causes. In her living room she paired a comfy beige sofa with a natural sisal rug and a coyote fur throw for a fuzzy accessory. Her green room has long been blogged and talked about, so here it is! This classy living room looks almost as if it’s fit for a president! 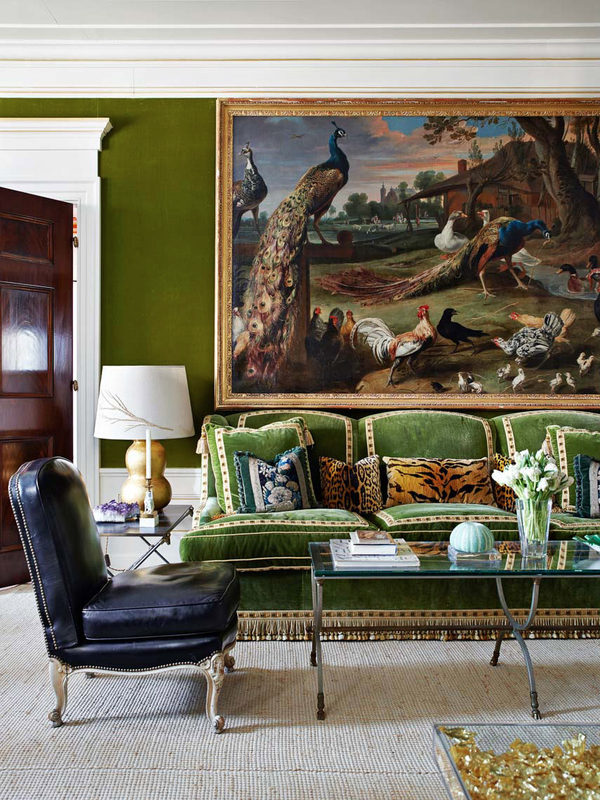 The huge artwork on the wall featuring peacocks and other various birds looks like a priceless piece hung above the custom made green velvet sofa. I absolutely adore how she placed the tiger printed pillows right in the center of the sofa for an instant eye catcher! With those long glossy hippy style locks. there is no wonder Whitney decided to decorate her space with a bohemian flair. The natural take on her decorating seems so comfy and relaxed. The rustic coffee table and mis-matching furniture makes everything look as if it was found at an exotic flea-market. I also love that she added light-colored flooring which makes the space feel super light instead of the usual choice of heavy, dark flooring that would weigh the space down. Gisele needed a living room to live up to her high-profile lifestyle and this eclectic room does just that. The circular chandelier makes this room fun, and the high back velvet sofa was an ingenious way to carve out a conversational area. Anyone out there watch her hit TV shot on E!? I’m always in awe of the shots of her home and office when they feature it on the show. Diane uses some of the most catchy, psychedelic patterns in her clothing as well as home decor line. 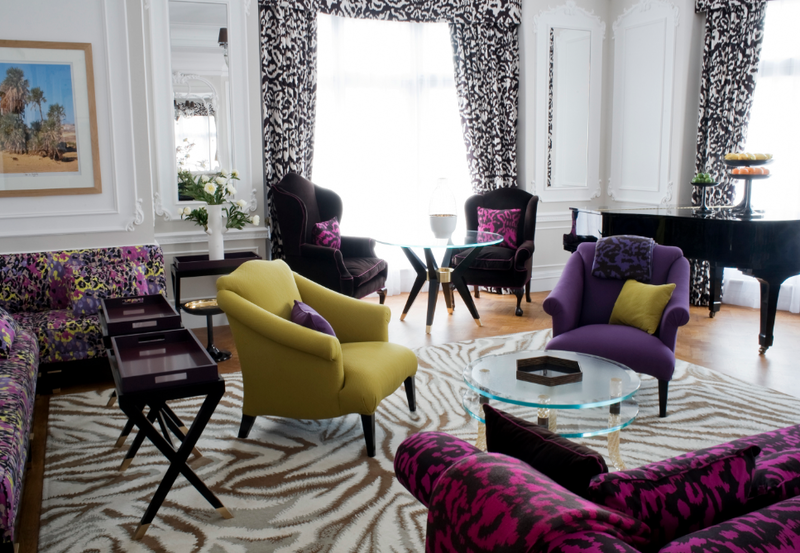 This is her suite in Claridges in London when she comes to stay during her visits to Europe. What do you think of these celebrities living rooms? What would you rate their decorating style? Comment below! 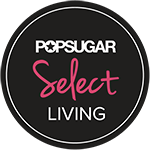 This entry was posted in Living Rooms and tagged better decorating bible, blog, bohemian, celebrity living rooms, decor, dian von furstenberg, donatella versace, dvf, gisele bundchen, karlie kloss, kourtney kardashian, tom brady, tory burch, whitney port. Bookmark the permalink.